As a newly discovered breed of cat, the Lykoi’s history is not very long. Tennessee-based breeders created this breed in 2010. A genetic mutation occurred in the breeding of a domestic shorthair cat and the breeders have simply taken advantage of this mutation to continue breeding the rare kitty using natural processes. Dermatologists at the University of Tennessee studied the kittens for genetic mutations as researchers were concerned, due to the abnormal coat belonging to the Lykoi, that there would be skin abnormalities. What researchers discovered was that the hair follicles belonging to the kittens did not allow for the growth of hair in certain locations. Additionally, certain follicles that had the opportunity to grow hair did not have the ability to sustain it so they would continuously lose their hair over time, sometimes causing them to go completely bald. Despite this, researchers determined that the Lykoi has no relation to the infamous bald kitten breed, the Sphinx. The kittens were deemed healthy and the breeding program for the Lykoi kitten began in September of 2011. The Lykoi personality has been most compared to that of a hound dog. They love to hunt around the house and are quick to pounce on their prey. They are said to be a very loyal and intelligent cat and they love to play fetch. Lykoi love a warm lap but are usually very active and playful, often keeping themselves entertained in a separate room from their human. Similar to other cats, Lykoi love the sun and seek it out frequently but are not overly cold despite their thin and often nonexistent coats. In other animals (dogs and horses) the coat pattern of the Lykoi is called ‘roan,’ however the Lykoi is the only cat that exists with this particular coat. 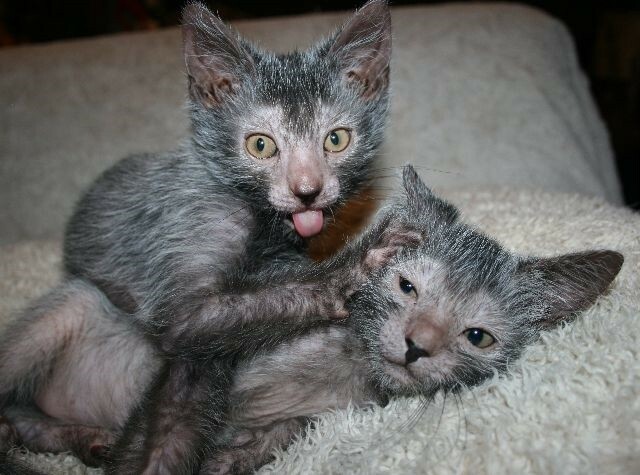 Some Lykoi are completely hairless while others are completely covered in hair. 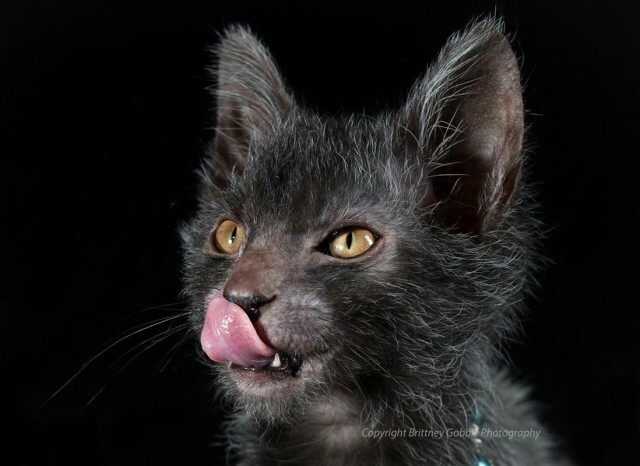 All Lykoi lose their coat at least once in their lifetime. No Lykoi has been bred with hair around its eyes, chin, nose, muzzle, or back of their ears and these areas frequently have a leathery feel to them. Most Lykoi have sparse hair covering their legs and feet. The skin of the Lykoi is mostly pink except in circumstances where they are in direct sunlight. After a few days the Lykoi skin will darken in some places. Male Lykoi are significantly bigger than the females, yet both are markedly lean. There have have been no discovered genetic health issues or concerns for the Lykoi cat. They can have any health issues found in your typical barn cat. The Lykoi is not hypoallergenic though it is said that some allergen sufferers are not bothered by the Lykoi cat. However, it depends on whether an allergy sufferer is allergic to a cat’s dander, saliva, or hair. 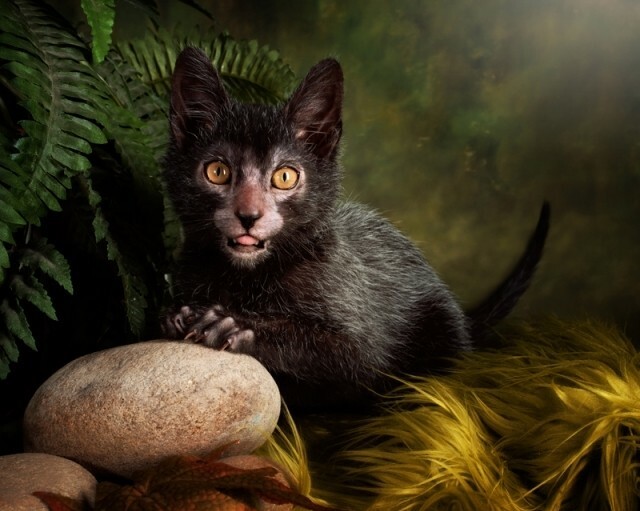 It’s expected that the Lykoi kittens will be available for adoption in year 2016. At this time they are being bred in small numbers as their gene pool is not very large. 1. an inbred animal (as in “small gene pool”) will always have health problems–they may not show up in the first generation or two, but they are inevitable. 2. dander is just dried saliva, so they are the same thing–anyone who is allergic to one is allergic to the other. it is not possible for a human to be allergic to hair. 3. there are already millions of purebred pets and other animals who, because they are inbred, are doomed to suffer from genetic diseases and often premature death. their owners are doomed to high veterinary bills and the premature loss of the pet they love. anyone who contributes to this problem by creating yet another “pure” breed cannot accurately be called an “animal lover”–in my opinion, they love their own profits, not the unfortunate creatures they have created or the humans who will foolishly pay huge sums of money to own them. Why, oh why, oh WHY? Just cause we can mess with their genes, doesn’t mean we should. Damn they is fugly. I fear for their lives if they get outside. I’d run like hell if I saw one at night. I’d be like WTF is that? We aren’t really messing with their genes here… this is a NATURAL MUTATION. I WANT ONE!!!!!!!!!!!!!!!! Kqreux Seraph Tyrless yook! We. WE want…like…four of them $#%&!@*es. your abuse of the english language is far more atrocious than their appearance. Thank you for your comment on language. There seems to be no escaping it. Nothing screams “bad$#%&! @*” like having your own army of werekitties.